A small, upright, spreading tree with many attractive features, Eastern Promise (Sorbus 'Eastern Promise') has delightful fern-like leaves producing excellent autumn colours. Furthermore, large bunches of spectacular deep rose-pink berries hang from its branches. . 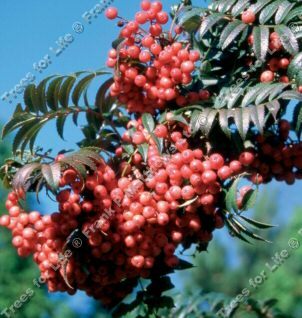 This tree is supplied at a height of between 1.5 and 2.4 metres in a 12 litre container for year round planting and better results than from either bare-root or rootballed stock. The size range is considerable as it depends on when in the year you purchase them and what the previous years weather has been like.